I’ve Been Recruited for Leap Day! Back in October of 2011, Katie Sluiter asked me if I was interested in writing for her blog. Because I adore Katie Sluiter. First of all, Katie is a high school teacher of both English and Spanish. How cool is that?! ¡Muchos Coolos! I found Katie when she just had one little boy, and I squeeeeed aloud when she announced she was pregnant! So when Katie asked me to write for her, I was all: “Yes! Yes! Now! Now! But Katie and I ran into some scheduling difficulties. Finally, she told me to just pick my date. 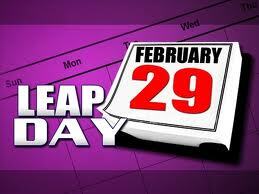 Because I picked today, February 29th – Leap Year – a magical day that happens once every four years. And I figured I’d better do something really special. And now Katie is 9 months preggers, y’all. It’s practically go time for my beloved Katie. Come see what I wrote for you at Sluiter Nation. This entry was posted in Guest Writers and tagged Katie Sluiter, Leap Year. Bookmark the permalink.